Within a time of days, since the start of April, two countries have come very close to get rid of the long imposed sanctions by USA. First Iran and then Cuba have reached in a good point of amelioration of relationships with their foe and are close to an ending of the imposed sanctions. “Disfavor” and “punishment” have started 50 years ago in Cuba, during Cold War, and soon after the Islamic revolution of 1979, in Iran. In both cases, the sanctions followed the revolutions and the change of regimes, non capitalist policies, nationalization of oil (in Iran), of companies, services and country’s wealth. Also in both cases, before the revolutions, US had deeply involved in internal affairs and had secured conformity of the governments. After revolutions they never stopped attempting the overturn of regimes – their endearing practice worldwide. Cases of US espionage in Cuba as well as attempts to organize dissident movements (according to the successful “arab spring” standards) reveal until recently. In Iran, as Juan Cole in Informed Comment reminds us: “It is worth pointing out that one of the reasons Obama has difficulty in his negotiations with Iran is that its leader, Ayatollah Ali Khamenei, distrusts Washington because of its long history of intervention in Iran. The US along with its WWII allies invaded and occupied Iran in the 1940s; the allies overthrew the ruler, Reza Shah Pahlevi in 1941. In 1953 the CIA conducted a coup against popular Prime Minister Mohammad Mosaddegh because he led the nationalization of Iranian oil. After the 1979 Islamic Revolution of Ayatollah Ruhollah Khomeini, the US allied with Saddam Hussein of Iraq, who had invaded Iran in a wanton act of naked aggression in 1980. When Saddam used chemical weapons against Iranian troops, the US ran interference for Baghdad at the UN Security Council, ensuring that Baathist Iraq was not sanctioned for its war crimes against Iran. The question which arises after the recent developments is “why now?” Although the two “cases” are completely different, a first insufficient answer is the attempt of President Barack Obama to ensure his own and Democratic Party’s legacy during the last year of his presidency. It is not a totally satisfying answer, even if Obama might actually be “an honest man”, as Cuban President Raoul Castro said. Apart from honest though, Obama still is the President of the almighty USA. As “peace” and conciliatory policies are not typical of US, a more realistic version could be the need to close any “unnecessary” open fronts worldwide despite pressures from neocon Republicans and jingoes of NRA. On the other hand, progressives within the country are demanding less aggressive policies, as longstanding wars have not only proved ineffective and costly but have also showed their wrongful and detrimental motivations. Furthermore, the dominant principle in US (i.e. in capitalism) is profit. Sanctions burden American economy, not only that of the “punished” countries and don’t give earnings from sales of weaponry. So sanctions, especially long-standing ones, have political cost apart from economic and reach a crucial point, when it becomes necessary to lift them. American companies are going to seek profits from Cuba and it is Cuba’s responsibility to manage and control hawks’ involvement in national affairs (a danger that EU is close to suffer if they sign TTIP neglecting people’s objections). There is also strong possibility that US will use normalization of relationships with Cuba as a means to succeed closer approach to other South American countries. US has opened a huge front against Russia, under their own crafted pretext of Ukraine, and until their own and EU pressures pay back, they simply lose profits while they do not have the anticipated gains of their expansionism. They also continue sanctions as well as attempts to overturn government in Venezuela* and, additionally, they have to “pay” the cost of past nourishing of fighters who became the core of ISIS. “Axis of evil” has shrunk significantly since Iraq became a conquered country, after Libya was destroyed and after Syria entered the US-crafted and non ending war. It is also going to further weaken as soon as a final deal will be signed with Iran. A large part of “destruction policies” could be attributed to the former Secretary of the State and new candidate for US presidency, Hilary Clinton. As far as it concerns the remaining North Korea, Japan could be the first frontier if necessary. However, military threat is not the only reason which US invoke when it comes to sanctions. Human rights and their strictly American interpretation often form a pretext for imposing sanctions. Never mind if human rights are violated by numerous “allies” and within US. It makes no difference if a society is functional despite whatever problems. If a country doesn’t follow a certain model of life, if its government does not conform to Western standards, if strategic considerations or intelligence want them to “reform”, either a war or sanctions will be the consequences. The internal administration and the sovereignty of any such country, surely threaten “democracy” and therefore, US have to take initiative. In case that propaganda by NGOs and press and attempts of erosion and/or overturning of government do not succeed, intelligence takes control and isolation follows. 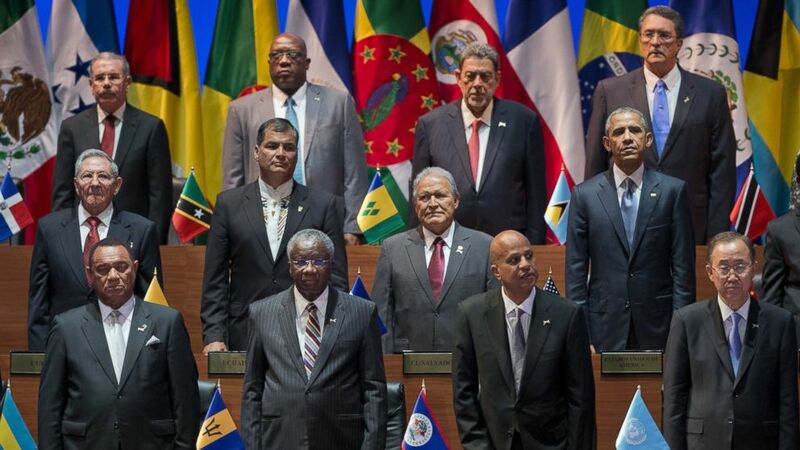 On the eve of Summit of the Americas in Panama, where Castro and Obama met, People’s Summit of the Americas, issued a document, which was approved by more than 2,000 representatives and condemned what it called, “military aggression and threats by the United States and their strategic allies carried out through the establishment of military bases in the region” according to teleSUR information. The case of Russia does not follow above rule of “safeguarding” human rights. Russia has a record of human rights violations which didn’t bother in the slightest the “democratic” West. The manufactured rising in Ukraine ended with outrage and autonomy of pro-Russian Crimean regions and with a war induced by NATO. If Russia had retracted, if Putin had succumbed without acting, a large part of population would have been led into EU’s and NATO’s “embrace” and no sanctions would have been imposed. Alternatively, another way of isolating Russia would have been induced. In the same time, propaganda would persuade the world that rising in Ukraine was spontaneous and that people’s future is in their hands. In the meantime, the “compliant” EU loads an extra weight on the backs of its people by imposing sanctions and suffering the consequences. Though world changes (even Tayyip Erdogan visited Iran), let’s not fool ourselves and let’s hope that neither Iranian and Cuban people nor their governments fool themselves by believing that the “war” has ended. * South American countries back Venezuela and UNASUR, the Non-Alignement Movement, CELAC and the G77+China, condemned Obama’s Executive Order.